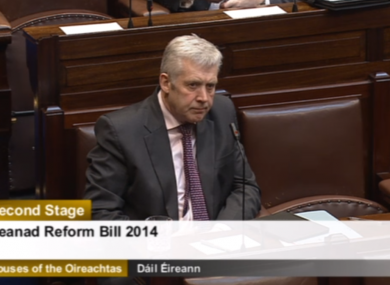 Fergus O'Dowd spoke for the government in the Dáil today. MEMBERS OF THE travelling community, the elderly, people with disabilities, and representatives from the sporting and art worlds should be voted into the Seanad, according to the latest proposal to reform the upper house. Today Fianna Fáíl’s Seanad Reform Bill 2014 went through the ‘second stage’ in the Dáil, but the government has said it will oppose the measures in the Bill. Fianna Faíl leader Micheál Martin said that at the core of the Bill is “the objective of making our political system more democratic and more accountable”. He noted that events of this week, from Garda Commissioner Martin Callinan’s resignation to revelations of phone tapping at Garda stations, had “shown yet again how badly we need real reform”. Martin accused the government of staging “the most cynical poster campaign ever held” before last year’s referendum on the future of the Seanad. He said that the only way “to rebuild a parliament worthy of public support is to listen to the demand for substantive reform”. The Bill proposes extending Seanad voting rights on the higher education panel to graduates of all recognised universities and colleges, and looks into extending the franchise to Irish people living abroad. Independent TD Finian McGrath supported the Bill, saying that the government had engaged in a “disgraceful campaign” to promote the abolition of the Seanad. He said that there needed to be “new and fresh talent” in the Seanad and supported the proposal of voting in currently “ignored” representatives of people with disabilities, the elderly and the Travelling community. He described the elderly as “the backbone of Irish society” and said that Travellers are “marginalised and experience racism every single day” – something that “should not be tolerated in any democratic country”. Speaking on behalf of the government, Junior Minister Fergus O’Dowd said the coalition did not support the Bill and refuted “the content, the tone and the hypocrisy” of Martin (above). He accused Fianna Fáil of engaging in “lame duck politics” and told Martin he was “noted by your absence rather than your presence” in the Dáil. When this comment was met with shouts from some Fianna Fáil members, O’Dowd said: “I appreciate that your presence here is rare so perhaps you want to be recorded on the sound system”. McGrath stood up for Fianna Fáil and nominated O’Dowd for the “brass neck of the year”, saying “over the last few days your silence was deafening”. O’Dowd claimed that “many of the provisions in the Bill are incomplete or would be unworkable”. He noted that there would be a huge cost in extending the postal vote and said there was “no detailed provisions in the Bill for counting the votes”. He added that members of the Seanad needed to “play a key role in improving legislative changes before enactment” and be given time “to clarify any issues” they have. Sinn Féin TD Seán Crowe said the Bill won’t “fix the system”. “I don’t think it’s radical enough,” he stated. Fine Gael TDs Frank Feighan and Eoghan Murphy also spoke on the Bill, Feighan praising the Taoiseach for nominating independent voices to the Seanad three years ago, while Murphy used the opportunity to raise some of his own Dáil reform proposals. Independent TD Maureen O’Sullivan said that Seanad to date has been “used by political parties .. as a training ground for prospective TDs or a retiring ground” and noted that all of the reform bills put forward had the necessary common goal of “widening the electorate”. Last month environment Minister Phil Hogan published the government’s Seanad Reform Bill last month which proposes to widen the electorate to all third-level graduates. Email “Minister nominated for 'brass neck of the year' as TDs row about Seanad reform”. Feedback on “Minister nominated for 'brass neck of the year' as TDs row about Seanad reform”.